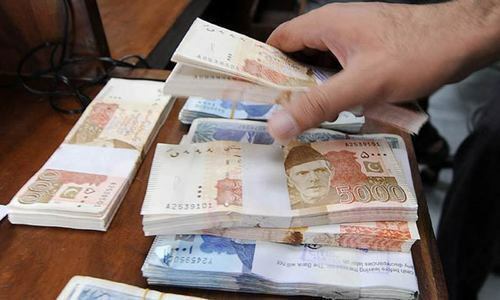 ISLAMABAD: The government fears the high twin deficits — fiscal and current account — could pose challenges on the external front as the country moves into the next fiscal year. According to latest official estimates, the fiscal deficit for the current year is estimated at 5.5pc of GDP — far higher than the budgeted target of 4.1pc — while the target for next year is being set at 5.3pc of GDP. The current account deficit on the other hand is officially targeted at $12.5 billion (3.8pc of GDP) for next fiscal year compared to $10.8bn in first eight months of the current year. The figure for same period last fiscal year stood at $7.2bn. The full year current account deficit for the outgoing fiscal year is estimated at $13.7bn or 4.4pc of GDP. “High fiscal and current account deficit in 2017-18 may pose a challenge on external front,” said an official summary approved by the Annual Planning Coordination Committee (APCC) early this week. The government expects exports to go up to $27.3bn in 2018-19 compared to $24.5bn of current year while imports are targeted to $56.5bn from $53.1bn this fiscal year. This would result in trade deficit of $29.2bn next fiscal year compared to $28.6bn during current fiscal year. The government expected the resurgence of global commodity prices in 2018-19 would be a positive signal for exporters. “Concerted efforts are required to enhance quality of exportable, diversify product range and look for new markets”, said the summary. With CPEC investments and better performance in industrial sector, exports are expected to gain momentum and grow by 11.6pc compared to 6.3pc increase in imports during 2018-19. In overall terms, the government expected “positive economic growth prospects” for 2018-19 on account of strong expected performance of agriculture, steady growth in industrial sector emanating from acceleration in large-scale manufacturing and improved energy supply. Inflation, though slightly picking up, is expected to remain below 6pc for the next year, said the Ministry of Planning and Development. The government also forecast overall macroeconomic stability in view of encouraging agriculture performance and steady industrial growth. “The GDP growth for 2018-19 is targeted at 6.2pc with contributions from agriculture (3.8pc), industry (7.6pc) and services (6.5pc)”, the Planning Ministry said but added that the “growth targets would be subject to favourable weather conditions, managing current account deficit, consistent economic policies and aligned monetary and fiscal policies”. It said the agriculture sector was targeted to grow by 3.8pc on the basis of expected contributions from important crops (3pc), other crops (3.5pc), cotton ginned (8.9pc), livestock (3.8pc) fishery (1.8pc) and forestry (8.5pc). Higher production of cotton crop is also expected during 2018-19 given better performance in 2017-18 and increasing trend in prices. The growth prospects for livestock, fishery and minor crops are also bright, the Planning Commission said. On the industrial side, the Planning Commission anticipated robust growth. In view of steady growth rate during the current fiscal year, the industrial sector was expected to grow by 7.6pc during 2018-19 on the back of better energy supply and planned investment under China- Pakistan Economic Corridor (CPEC). The mining and quarrying sector is projected to grow by 3.6pc, manufacturing sector by 7.8pc, LSM by 8.1pc, construction by 10pc and electricity generation & distribution and gas distribution by 7.5pc. Moreover, the increase in consumer demand is expected to further spur private sector activities and help maintain aggregate demand, the Planning Commission said. It said the services sector was targeted to grow by 6.5pc in 2018-19, supported by growth of 7.8pc in wholesale & retail trade, 4.9pc in transport, storage & communication, 7.5pc in finance & insurance, 4pc in housing, 7.2 percent in general government services and 6.8 percent in other private services. “The expected higher growth in commodity producing sectors will support the targeted growth in services sector”. The fiscal policy during 2018-19 would remain focused on containing fiscal deficit, mobilising more revenues, controlling current spending and switching to targeted subsidies while prioritising development spending. It said the expansionary monetary policy has generated economic activity in private sector over the current year and there were signs of improvement in LSM with expansion plans announced by major industries. Thus, momentum in the demand for credit is expected to pick up pace.